With tomorrow being Dia de Muertos it seems like the perfect time to talk about the “Santa Muerte Oracle” by Fabio Listrani (since according to R. Andrew Chesnut it’s becoming a “feast day” for Santa Muerte devotees). There is a lot to unpack with this deck, and all of it is good. First, I must address the packaging. A solid box that the top pulls up from. Inside an actual booklet as opposed to those flimsy pamphlets you often get. Lastly, a ribbon to help you remove the cards from the box. All of these helps prevent wear and tear on the deck unlike the form fitting, thin cardboard sleeve style boxes that other decks have come in. The artwork is striking. 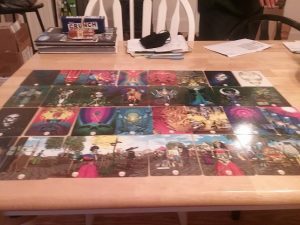 The deck contains 32 cards, divided into 4 parts: Emanation, Creation, Formation, and Action. Each part has its own style. There’re more than just images of Santa Muerte, but also Dias de los Muertos imagery, and assorted deities. Did Listrani use this bold style in his previous deck “The Santa Muerte Tarot”? Sadly, I missed out on that one, so I’m unsure. 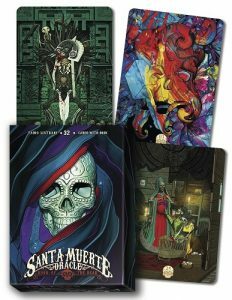 Speaking of Listrani’s previous deck, the book included with the “Santa Muerte Oracle”, implies this deck could be used in addition to the “Santa Muerte Tarot”. Since I just have the Oracle, let’s focus on all the great ways you can use the deck! The deck. Becomes. 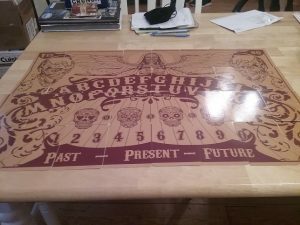 A Ouija board. Boom. Mic drop. We’re done here. Learn more about this deck here.